It's no secret that parents struggle with lack of sleep when their children are born. 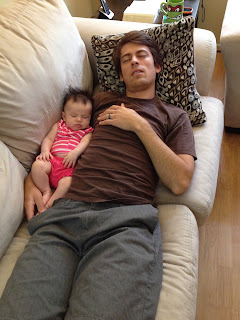 Babies don't sleep through the night naturally, and so it takes anywhere from a few months to a year or two for them to learn to sleep all night. If you haven't experienced this, you can imagine what it will do to a person, waking up every night 2-3 times for months on end. Coffee becomes your best friend, the silent third partner in your parenting alliance. You rest when you can, especially in the early years. It's silly, but somewhat reasonable, right? If she goes to bed late, she should sleep late. And maybe that's the problem -- my expectations are too rational for parenthood. Rearing children doesn't make sense. We had it pretty good before kids, staying out late with friends, going on snowboarding trips and camping and to concerts whenever we wanted. And then we brought these little children into the world that are almost entirely dependent on us, totally disrupting our convenient little lives in a way that will never be the same. It's all worth it, of course -- I know it is. But sometimes you just have to write a little piece first thing in the morning while you are sipping your coffee, hoping that someone else feels the same way. When was the last time you went to Captain D's? Probably a while. The only time I really ever went was with my grandfather because they had cheap fish, and he loved fish (and cheap food), but that had been years ago. I actually have been wondering lately how they ever stayed in business, because I don't know anyone who goes to Captain D's, but they're still here, so I guess someone does. Besides nice tasting fish and vegetables (along with a not-so-sugary cookie that came with my kids meal), I was struck by the decor. Shiplap abounded, as well as cool nautical themed decorations and a bright green wall. In fact, I have a hunch that Chip and Joanna Gaines got their inspiration from this long-standing restaurant and therefore owe the chain a portion of their successful business, or at least a hearty "thank you." 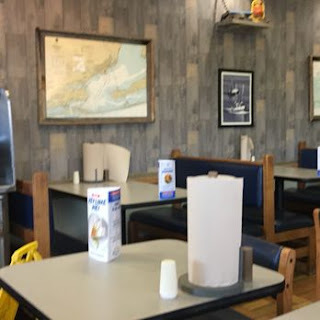 Yes, I would argue that Captain D's was the originator of the shiplap craze, and so if you are a fan, don't be afraid to debase yourself for a cheap fish sandwich and some fries. I really love music, especially sharing what I think is good music with others. And so when it comes to my kids, I think it is so fun to force them to listen to all the things I love, because they don't really have a choice at this point, do they? Haha! Of course, I don't make them listen to things they have expressed a disinterest in, but if I want to listen to some of the good ol' punk rock I enjoyed in my formative years, they might as well hear the same thing. In those formative years, I pretty exclusively listened to Christian music. Currently, I still don't listen to anything too racy, but as I am paying attention to the lyrics from more recent bands I enjoy, they can occasionally be about less kid-friendly topics. "Rhythm and Blues" by The Head and the Heart for instance -- the kids love this song and sing along every time. But when he says, "Oh come on darlin,' won't you let me drive you home? Oh come on darlin,' won't you let me turn you on," well, that's not something you want your kids singing, is it? Or a more subtle one that comes from a recent favorite of mine, The Strumbrellas, is their song "Spirits," which is catchy and I am sure expresses some deep conflict or introspection on the part of their singer. But I just don't love hearing my kids sing, "I got guns in my head and they won't go, spirits in my head and they won't go." I tried to make it a little more G-rated by singing, "I got bugs in my hair and they won't go, spiders in my hair and they won't go," but Ellie soon realized I wasn't singing the right words and ignored me. (Plus Katie reminded me that that sounds like they have head lice.) It seems my kids have a great propensity for remembering words and melodies (something their Aunt Nicky has always been good at), which secures my belief that they will one day change the world with their music; but in the meantime, I have to be careful of what I listen to around the kids. My solution lately has been to put a little more emphasis on fun worship music, or at least songs about God in general. I'm not a huge fan of worship music really, but a couple bands I love are All Sons and Daughters and The Rend Collective. They make good folk music that isn't cheesy or generic. I still find it difficult to really enjoy most worship music though, so if you have any suggestions, please let me know! Another victory in this area is that the girls typically like it pretty loud in the car (the little punk rock princesses that they are), but they used to just yell, "Louder!" to make their volume requests. Well, it has taken a while, but they are finally up to saying, "Louder please!" when they want more music and less Mom and Dad talking. It's the little things that keep you going, isn't it? There seems to always be some sort of struggle in the Christian walk when it comes to trying harder. Or maybe "tension" is the right word. It is easy to find yourself striving to be better, without ever seeking the heart of God. I'm sure most of you have seen this, legalism in church or maybe a misguided, but honest pursuit of holiness. But without God, it is nothing more than striving, right? You may make some headway or develop some good habits, but is your heart changed? Are you free from sins that bind you? The other side to that tension can also be dangerous: depending so much on freedom in grace that holiness is not really a factor or a pursuit, though it is something God is certainly concerned with. So where does the balance lie between these two pendulum swings? According to scripture, it seems that God does way more work than we do, but tonight I came across a verse that gives us a good clue of what our parameters may be in this realm. There is a total humility here when we realize that it is God who works in us, not only to be blameless, but even to want to be blameless. That is crazy to me. Even the will to want to be better is from God. To me this really takes a lot of pressure off of us, not so we can say, "Well, I don't want to do this right now, so I guess I don't have to;" but rather because when we don't want to do what's right, we just need to ask God to inject our lives with that desire. If it is something we are ready for, and a place God wants to take us, why wouldn't he answer such a prayer? But then right after that, Paul gives us some very reasonable actions that we can employ in our daily lives: in everything you do, don't complain or argue. Okay, that's pretty simple. I'm kind of bad at not complaining sometimes, but that is something I can probably quit whenever the Holy Spirit nudges me. And not arguing can be easy, particularly when we respect each other and realize that the unity of the church is one of God's top priorities. I love the simplicity of scripture sometimes. Of course it can be complicated, humans are complicated, life is complicated. But then there are verses like these, that give us something to focus on, while also reminding us that the bulk of the work is God's. And what a gracious God we serve that he would even want to make us better and freer people in the first place.